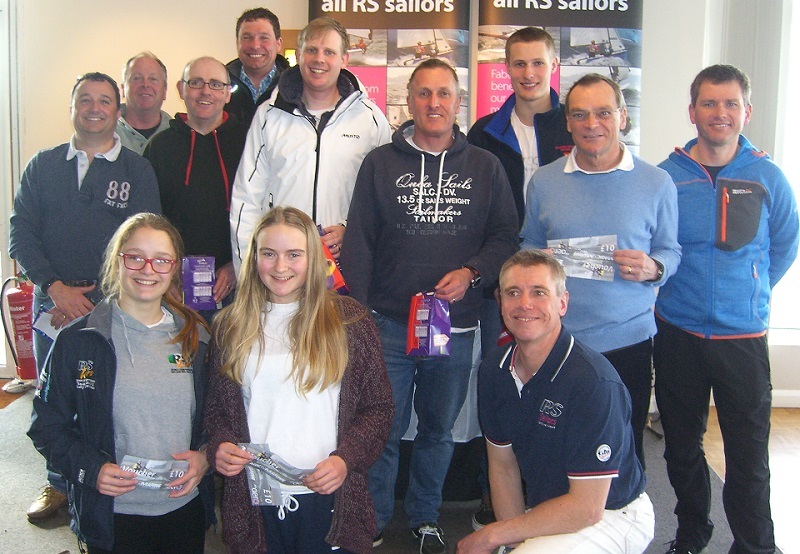 Over the weekend of 19/20th March, the travelling RS Aero fleet ventured to Grafham Water with 20 Aeros contesting the Magic Marine Spring Champs, our ninth and final event of the 2015/16 Winter Traveller Series. It had been a mainly windy series to date, with the Tiger Trophy, Steve Nicholson, Bloody Mary and Roadford Rocket to name a few of the windy events, only Starcross to date had been there for the light wind specialists. The forecast had a high pressure system drifting around the UK, with its max pressure expected over the Irish Sea, giving the East of the UK a decent northerly on the Saturday, expecting to drop for the Sunday. They got it right, Saturday saw 10-15 knts, Sunday, a 5-10 knts breeze. This lead to a range rigs being used, most going for the mid-size 7, a couple using the Sunday forecast wind to guide them towards the 9, the lighter sailors, Caitlin Atkin and Lucy Greenwood keeping the 5 rig up all weekend. Sharing the racecourse with the RS800s, PRO Peter Saxton and his team set a large trapezium course, with Aeros doing the outer loop, getting out there with a long tight reach, then a number of sausages, before another decent flying reach to the finish. Leading the way in the first race was Peter Barton (7) closely followed by Matt Thursfield (9) and Fergus Barnham (7). These three were, on the whole, the pace setters for the weekend, although it was not speed through the water that was key. The shifts and gusts on Grafham were a challenge to many - the difference between getting the beats right and wrong was huge, leading to many frustrated sailors who had picked the shift, only to be left hanging as a more advantageous lift came in from the other side. It became a huge game of snakes and ladders that the top three just seemed to get luckiest. Fergus lead overnight from Peter, with Matt in third. Caitlin Atkin was in the lead 5 rig although she knew the lighter winds on Sunday might test that position. Post sailing, Grafham hosted many of us for a bite to eat and the watching of England vs France - a tense affair. It was here that some guidance was offered to one of Grafham’s Aero sailors However, Jonathan Rickels proved his worth by leading the pack for the majority of the first race of the following day. He went right off the start and right up the beat, and was leading by a good 30 secs from the chasing pack. Unfortunately it wasn’t to last, as Jonathan came home in 12th place, having found a “snake” on the second beat. By the start of the final race, it was between Pete and Fergus for the event. The winds were still decent, although the holes were becoming more pronounced as the sun started to burn through the overcast sky. Who did come to play in this final race was Rich Watsham (9). He picked the first beat, used the reach to pull away from the 7s, and was gone, never to be seen. Crossing the line behind him was Fergus, taking the Magic Marine UK Spring Champs, Pete having got the pin bias right but getting the beat less so, having to try banging the corner on the second one to try to get back to the front. He came in 5th place by the finish. Lucy clawed her way back into contention on the Sunday in the 5 rig, just missing out on catching Caitie who took the lead 5 overall. Rich’s victory in that final race wasn’t enough to get Matt who came third and lead 9, behind Pete in second. Race Management at Grafham was excellent (as usual) all weekend, huge thanks to those involved, both on and off the water, as well as to Clare from the RS Association for her efficiency and excellent support. The next event is at Reading SC on Saturday 9th April, followed by Broadwater SC, West London, on the 24th.